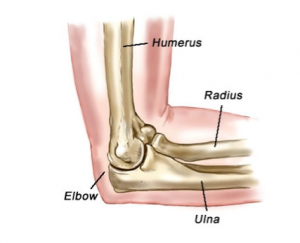 The elbow joint is composed of three bones: the radius and ulna (which are the 2 forearm bones), and the humerus (the upper arm bone). The end of each of these bones is covered by a smooth, shiny, white, Teflon-like layer of tissue called articular cartilage. This layer allows these bones to glide smoothly over each other during elbow motion. 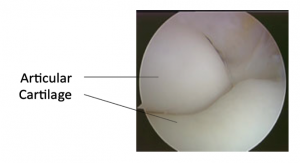 The following two pictures show normal articular cartilage. If this bone damage does not heal, the bone can collapse and leave a defect in the bone. 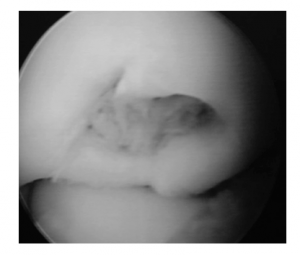 This bony collapse can also cause fragmentation of the overlying articular cartilage. 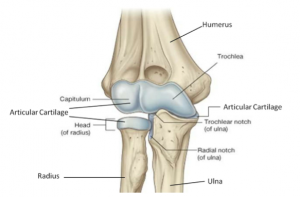 The damaged articular cartilage can then break off and create a loose fragment in the joint leaving a defect in the cartilage. As a result of this repetitive loading, OCD is commonly seen in throwing athletes (such as baseball pitchers) because throwing places great stress across the elbow joint. OCD is also seen in gymnasts because activities such as cartwheels and handstands place significant stress across the elbow joint. the course of OCD (when only the bone is involved) patients typically complain of elbow pain with sporting activities, such as throwing or gymnastics. As the condition progresses and the overlying articular cartilage becomes fragmented, patients may experience loss of motion, clicking, catching, and locking. OCD may be diagnosed by plain x-rays. Early in the course of OCD, the x-rays will typically be negative. As OCD progresses and the bone collapses, the x-rays will show the lesion (as shown in the image below). 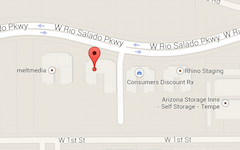 An MRI scan can be obtained to diagnose OCD. Early in the course of the condition, MRI will show the bony abnormality. As the OCD progresses, the MRI can show both the bone and cartilage abnormalities. The treatment for OCD depends upon the age of the patient, the condition of the cartilage, and the symptoms experienced by the patient. In younger patients with open growth plates and those in which the articular cartilage is not yet fragmented, non-operative treatment is recommended. Non-operative treatment involves avoiding the aggravating activities (such as throwing or gymnastics) for a period of 2-4 months to allow the bone to heal before it collapses. 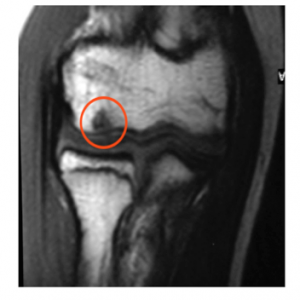 In older patients (with closed growth plates), in patients with cartilage fragmentation seen on MRI, in patients with mechanical symptoms (such as locking or catching), and in patients who have failed a long course (> 6 months) of non-operative treatment, surgery is recommended. 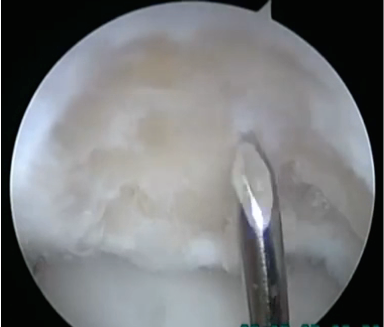 The surgery is performed arthroscopically (see Elbow Arthroscopy). Surgery involves removing loose cartilage fragments, smoothing out cartilage flaps (called chondroplasty), cleaning up joint lining inflammation (called synovectomy), and drilling holes in the bony defect to create bleeding to stimulate new cartilage growth (called microfracture) (see picture below showing a microfracture being performed). For larger lesions or for patients who have failed chondroplasty and/or microfracture, cartilage plugs may be taken from the patient’s knee and used to fill-in the void at the site of injury (called OATS procedure).